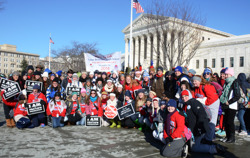 March for Life Trip to Washington, D.C.
For more than 25 years St. Benedict at Auburndale has sponsored a trip to Washington, D.C. in January for the nation's annual March for Life. The blessings that have come from this event have been manifold for the students themselves, the entire SBA family, and our nation. SBA is committed to the education of the "whole person" - spiritually, academically, and physically. We consider this event of great importance in helping our students to think critically on moral issues today and to stand up for their moral beliefs. This year marks the 38th Anniversary of the Supreme Court decision legalizing abortion on demand causing the deaths of over 60 million unborn babies. 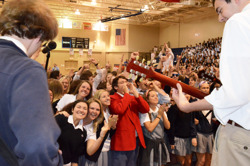 Homecoming week is always a fun and crazy time at SBA. Each class picks a theme and decorates their respective hall accordingly. Each day is a different dress-up day, ranging from students dressing up as their respective theme to dressing up as their favorite Holiday. Students also compete in different contests to try and earn points towards the overall Homecoming Championship. Each class competes in the hall decorating contest, Penny Wars, Wacky Olympics, and the spirit stick competition. These events lead up to the Annual Homecoming All-School Mass, Block Party, football game, the crowning of Homecoming Queen, and the Homecoming dance. Winterfest is similar to Homecoming, but is celebrated during basketball season. 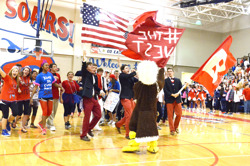 Although not as elaborate as Homecoming, students still dress up on different theme days, compete for the spirit stick, and crown "Most Spirited" at the Winterfest basketball game. 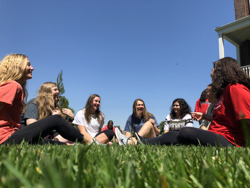 Each year, the Theology department hosts religious retreats that give students the opportunity to come together with their classmates to grow spiritually. Our Senior Retreat Leader team leads the students through games, activities, skits and songs that all deal with issues that teens face. The themes of the retreats reflect our school themes and are catered to the age of the class. The retreats offer students the chance to express their faith and support one another. Each year, Juniors and Seniors dress up in their finest formal dresses and tuxedos, hop in their limos, and head to the Junior/Senior Prom. Students take pictures and dance the night away. The Prom court is voted on which includes two princes, two princesses, one king, and one queen. 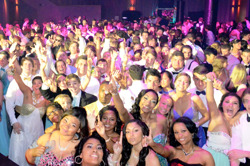 Prom is an SBA tradition that students always cherish and remember for years to come. SBA's got talent! Many talents are on display the Annual SBA Talent Show. It is produced by the SGA and open to the school community. Any student with a talent can try out to perform!